Hydrogen Peroxide is used to whiten your teeth. There are a variety of diverse treatment options ranging from a plastic bleaching tray to laser teeth whitening procedures called ZOOM Laser Whitening. The picture shown below are not touched up, they are of real patients. The bleaching trays are made in the office by taking an impression of your teeth and then fabricating a customized tray, made of plastic, for you to take home. 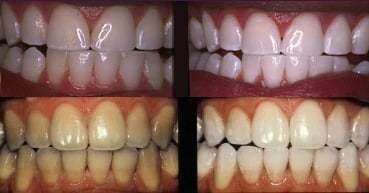 You can either wear the bleaching trays over night or for an hour a day, depending on the strength of the bleaching gel. The second option for teeth whitening is the ZOOM! laser whitening, which is done in the office. The total procedure time takes about 1 hour and 15 minutes to 1 hour and 30 minutes. Depending on the sensitivity of the teeth, the treatment may be less than the total allotted time. Teeth become whiter because hydrogen peroxide has the capability to open the dental tubules (analogous to pores and openings in your skin) and the peroxide cleans the tooth from the inside, which turns the teeth whiter. Since the dental tubules are opened, teeth also become more sensitive to cold, but this side effect is only temporary. Laser teeth whitening takes about 1 hour and 15 minutes. A gentle and safe gel, primarily based on hydrogen peroxide (H2O2), is placed on your teeth and the dental laser activates the gel. Darkened teeth can be lightened noticeably (> 8 increments on a dental shade guide). We use the most current version, called Zoom Sophisticated Power III, and have three devices waiting in the office. If you’d like, all three devices can be used at the same time so you and a spouse or a couple of friends can get the treatment together! Please inquire about gift cards.